Description: The California Fleece Hoody is a classic sport hoody with front pouch pocket and drawstring hood. 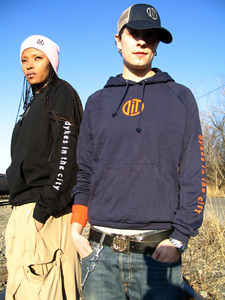 This comfy hoody with snuggly fleece lining on the inside and classic sweatshirt on the outside is screenprinted in contrasting colored ink with the DITC ("dykesinthecity") logo on the front and "dykes in the city" on the left sleeve. It is available in two color combinations: black with silver printing or navy blue with orange printing. The hoody is sized for men and women in a slimmer "retro" men's fit. It is longer in the arms and torso, but more snug in the torso width. Characteristics: Screenprinted on a "Standard American" hoody from American Apparel sweatshop-free clothing company. It is recommended you order a size larger than usual for a comfortable fit. *This item is the BLACK hoody.